Israel's top tourism official said Wednesday he had suspended talks with American evangelical leader Pat Robertson to develop a Christian tourist center by the Sea of Galilee after Robertson's comments last week blaming Prime Minister Ariel Sharon's stroke on divine punishment for withdrawing from Gaza. "(Sharon) was dividing God's land, and I would say, 'Woe unto any prime minister of Israel who takes a similar course to appease the [European Union], the United Nations or the United States of America.' God says, 'This land belongs to me, and you'd better leave it alone.'" "NO. I SAID, 'WOE UNTO YOU WHO TRIES TO BUILD A SIX FLAGS OVER JUDEA.'" "The government cannot do business with a man who said such a horrible thing about our ill prime minister," Tourism Ministry spokesman Ido Hartuv said. Honah lee. And frolicked in the autumn mist in a land called Honah Lee. "WOW. BEEN SCREWING UP THAT SONG FOR A LONG TIME." Israel had agreed to donate more than 40 acres of land on the northern shore of the Galilee, where Christians believe Jesus walked on water; in return a consortium led by Robertson was asked to invest $50 million to develop the Galilee World Heritage Park, a visitors center that would feature attractions such as a giant hall re-creating Jesus' path through the Holy Land. "HE SPENT TIME IN INDIA, YOU KNOW." "ANY MENTION OF A 'CREATIONLAND' RIDE? WHERE YOU CAN WATCH ANIMATRONIC LIBERALS BURY FAKE DINOSAUR BONES?" Evangelicals are staunch backers of Israel because they see a Jewish state as a precondition for the second coming of Christ. Many Jews have welcomed evangelical support without worrying about the role that Jews are assigned in Christian end-time scenarios: converting to Christianity or being slaughtered. "...Once Israel has occupied the rest of its 'biblical lands,' legions of the anti-Christ will attack it, triggering a final showdown in the valley of Armageddon. As the Jews who have not been converted are burned, the messiah will return for the rapture. True believers will be lifted out of their clothes and transported to heaven, where, seated next to the right hand of God, they will watch their political and religious opponents suffer plagues of boils, sores, locusts, and frogs during the several years of tribulation that follow. I've reported on these people, following some of them from Texas to the West Bank. "These people" meaning the "Rapture Right." They are sincere, serious, and polite as they tell you they feel called to help bring the rapture on as fulfillment of biblical prophecy. That's why they have declared solidarity with Israel and the Jewish settlements and backed up their support with money and volunteers. And that's why they'd love to build a Jesus-y theme park in Galilee. "IT'S AN IRON MAIDEN SONG." A war with Islam in the Middle East is not something to be feared but welcomed - an essential conflagration on the road to redemption. The last time I Googled it, the rapture index stood at 144 - just one point below the critical threshold when the whole thing will blow, the son of God will return, the righteous will enter heaven, and sinners will be condemned to eternal hellfire." Believe it or not, the Rapture Index is at 154 today. "AND ANGELINA IS PREGNANT WITH BRAD'S BABY." I liked Mr. & Mrs. Smith. "Israel on Wednesday said it would go ahead with plans to build an evangelical Christian heritage center in northern Israel -- but without Robertson. The (tourism) ministry said its decision to cut ties with Robertson was directly related to his comments. However, Israel will still continue with the project, (Deputy Tourism Minister Rami) Levy said. "Same joint venture, just the players are going to be changed," he said. "WHY WOULD THE ISRAELIS DO THIS?! IT'S LIKE...BUILDING A YANKEE MUSEUM NEXT TO FENWAY." Can you say, "$50 million in development cash?" "A constant flow of Evangelical tourist money?" "THEY AIN'T TOO WORRIED ABOUT THE END TIMES GOIN' DOWN ANYTIME SOON, ARE THEY?" 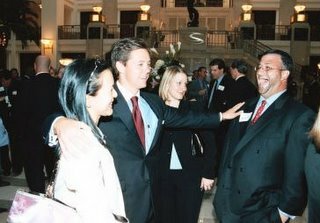 This photo, originally seen on Talking Points Memo, is a pic of Ralph Reed, Jack Abramoff, and Karl Rove's former exec-asst. Susan Ralston (allegedly) gettin' jiggy at the grand opening of Reed's consulting firm in 2003. Ask yourself one question: Would you want to party with this bunch?